District planning staff are to prioritize transportation needs and present them to the project manager. After reviewing the needs, the project manager will assemble a core team to gather data and analyze the need to identify potential solutions. Core team members are to come from different functional units and will represent that unit in the project development process. As representatives of the different units, each will have different areas of expertise and will have different expectations placed upon them. 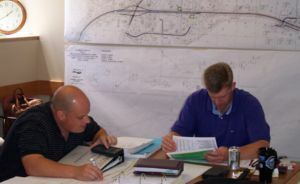 The core team uses meetings, field checks, public input and project development checklists to develop a scope. This page was last modified on 29 February 2008, at 09:13.